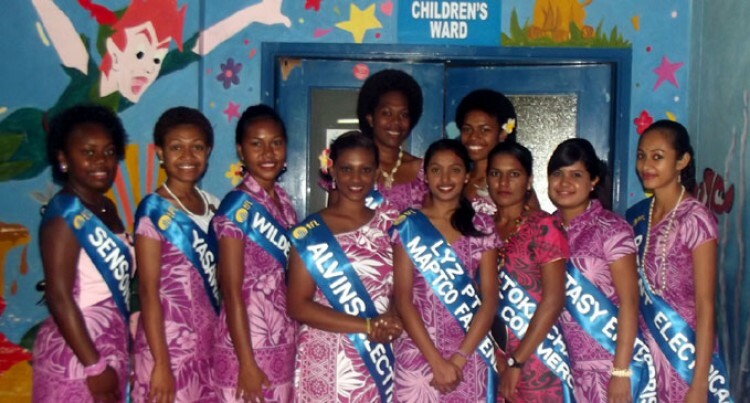 The Telecom Fiji Limited-sponsored Sugar Festival queen contestants visited the children’s ward at the Lautoka Hospital yesterday. This gave an opportunity for the contestants to be able to appreciate the work of the medical personnel as well as lift the spirits of the young patients. Although the visit was brief, the 10 queen contestants showed care and concern for the patients and their parents at the ward. Miss Teidamu Central Nursery Adi Sainimere Raikadroka said it was an emotional visit for her. “It was very emotional and touching to see the strength of the young patients in the ward,” Ms Raikadroka said. “I hope that our visit lightened their spirits today,” she said. “This is not my first visit to the hospital as I was doing industrial attachment at the Bio-medical department,” she said. The 23-year-old, a student at the Fiji National University studying Electronic Engineering, said she felt content after the visit. “Today I have learned a lesson to be resilient and strong in times of adversity,” she said. She commended the staff at the hospital for working hard and being patient with the kids.